Daniel’s Amigos, a tight-knit community of Daniel Suarez fans and sponsors, were inspired by Daniel’s passion and dedication to the sport and its followers to create a new and exciting way to support their favorite NASCAR driver. The Daniel’s Amigos movement brings together long-time race fans with new NASCAR enthusiasts who are experiencing the excitement of NASCAR by watching Daniel’s races every weekend. The group converged for the first time on March 17th, 2019 at the Auto Club 400 race in Fontana, CA. Over 500 lively Daniel’s Amigos came together with drums, flags, and non-stop chants throughout the race. Fontana was only the beginning. 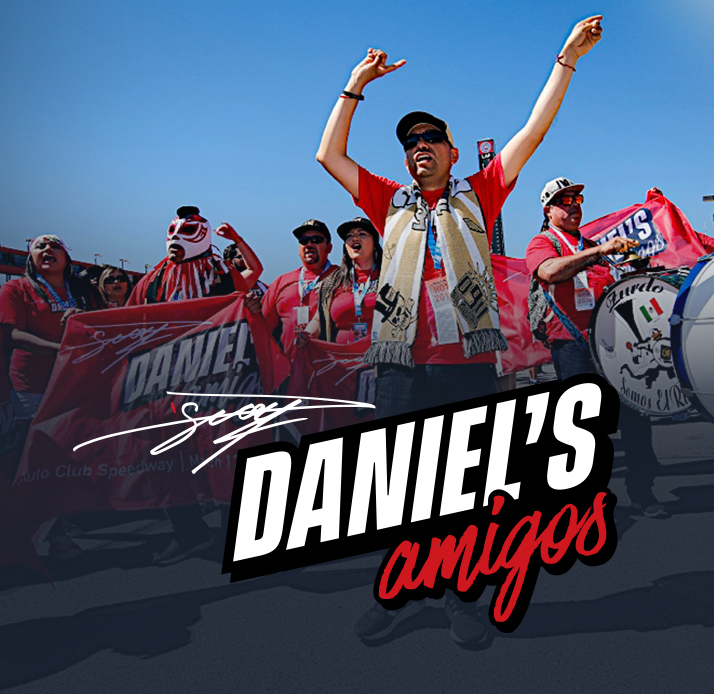 Daniel’s Amigos are planning to meet-up and attend more races in 2019 and beyond. By using #DanielsAmigos when sharing photos and videos across social media the group is spreading their love of their favorite NASCAR driver. You can become part of the movement by signing up to receive Daniel’s Amigos activities and events updates, and by showing your support for Daniel Suarez on social media.